I love cookery books, not only do I like cooking from them but I like reading them from cover to cover. I admire the beautiful photos and imagine the author creating all the wonderful dishes in far away places. I own many recipe books but my most favorite ones are those that tell a story and take you back to the roots. 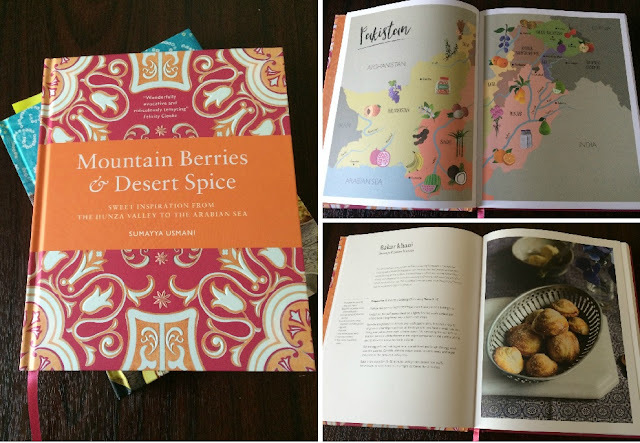 Mountain Berries & Desert Spice by Sumayya Usmani is one book that I totally fell in love with even before I had opened the front page. I loved the beautiful bold orange and pink cover with a paisley intricate flowery design. I immediately wanted to touch the book and peer at what it contained. When I looked at the book, I can say I was totally thrilled with the content. The book has recipes that are inspired from the Hunza Valley to the Arabian Sea. The book has authentic Pakistani sweet and dessert recipes using amazing spices and Eastern flavours. The desserts are very lavish and beautifully captured. Included in the book is a chapter explaining all the authentic ingredients used in the recipes which is extremely helpful for those who are creating the recipes for the first time and are new to the ingredients. The book takes you on a sweet and aromatic journey through mouth watering desserts. There are so many recipes that I want to make from the book such as the Pakistani Jalebis which are crunchy spirals dipped in a sugar syrup. 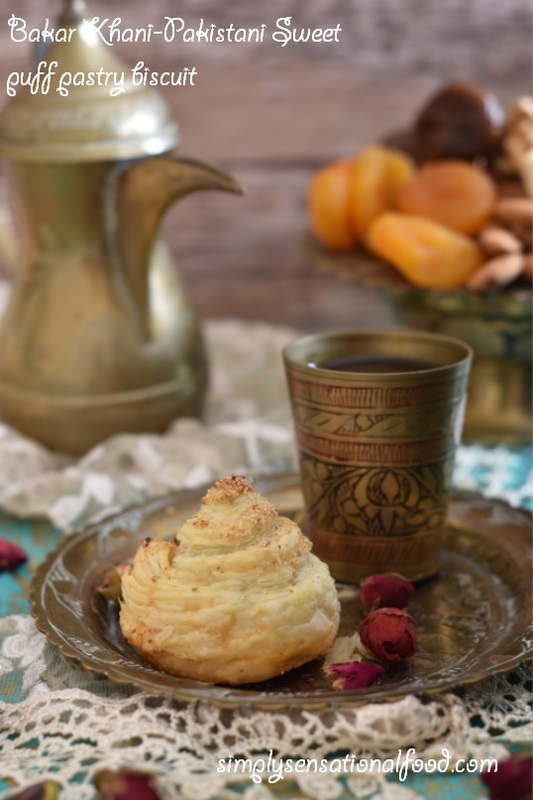 The Qawwami Seviyan, a roasted vermicelli topped with nuts and Bakar Khani which is a sweet puff pastry biscuit. I finally started with the Bakar Khani, you can see my recreation below which was made with a few minor changes from the original recipe . 1. Preheat the oven to 180 degrees C/350 degrees F 2. In bowl add the nuts, cardamom powder and sugar and mix together well.3. On a lightly floured surface unroll the puff pastry and smooth it out.4. Brush the pastry with the melted butter and sprinkle the chopped nut mixture on top.5. Roll up the pastry from the long side and make a swiss roll shape.Secure the end by pressing the pastry down with your finger, so that the biscuits don't unravel whilst cooking.6. Cut the pastry swiss roll into 1 cm thick rounds and place them on a grease baking tray.7. Using your fingers apply pressure to the outer edges of the discs to flatten them slightly to thin them so that when baking the centre of the biscuit rises to form a dome shape.8. Brush the biscuits with some milk using a brush and sprinkle them with poppy seeds. 9. Bake in a pre heated oven for 18-20 minutes, until the biscuits are a light golden brown in colour. The original recipe did not have nuts in it , that was my personal addition. The Bakar Khani, turned out delicious and they were really flaky and delicious served with a cup of strong Arabic coffee. You can store them in an airtight container for up to a week. I totally loved the book and would highly recommend it to anyone who likes Eastern desserts. My score for the book: 14/15 this is a high score but the book is definitely worthy of it. Wow... these look awesome ! We LOVE basked goods in our house. I will have to give this a try. Looks really good. This cookery book looks and sounds amazing. 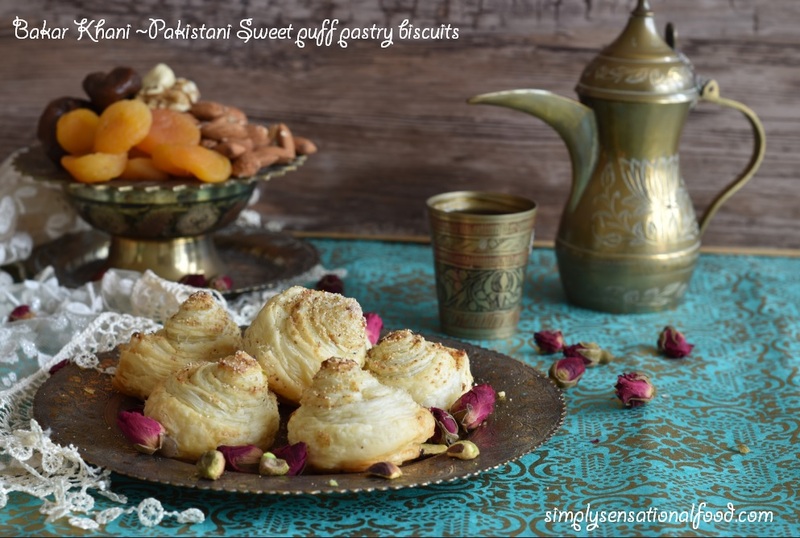 I love spicy biscuits made using puff pastry and these sweet nutty ones look delicious. These biscuits sounds delicious, very easy and fuss free recipe! looks so yummy! i want to try it also! This is a recipe I will want to try out. Very easy steps and yummy looking biscuits! I have never tried to make puff pastries before, but I have seen them done on television. They really seem tour to make! Ooh, I would love to try these! Looks like a super-light biscuit! I usually pass because biscuits are so heavy! I'm usually useless with baking but these don't seem too difficult to make! I bet these are great with coffee! OMG I need some right now! Although I"d stick to the original recipe and make mine without nuts...these sound like the perfect addition to a few cups of arabic coffee! Wow! I love cream puffs and I wanna try making my own. Glad I came over your recipe. I hope I can perfectly do it too! I love cookery books, this sounds like a fantastic one. It looks yum! I love pastry puffs. I wish I could taste that kind of puffs too. These look absolutely scrumptious. Would love to try this recipe. You have caught my attention at pistachio, almonds and cashew. I can't believe how easy it is to make these delicious biscuits. It's always handy when you can use already made puff pastry. I'm not normally a fan of cookbooks but this once looks so pretty! I will bookmark this recipe it sounds so tasty and easy to cook! Omg those look absolutely delicious! I don't eat sweets that much but I would want to try a bite of this one! I love creating meals using puff pastry . I usually make savoury meals with it but now you have given me a new reason to use it. I love almonds so this recipe really appeals to me. These sound so delicious. Sweet puff patries are so dang good. I never tried this variation though, wouold be intresetsted in making them. my family loves cardamon --even in these special teas - but can you still make that without the nuts? or it needs to be replaced with another ingredient? The original recipe in the book was made without nuts so you can omit them and just sprinkle the pastry with brown sugar and cinnamon / cardammon to give sweetness. This one looks so yummy..will definitely try! Eastern desserts are the best! I grew up in komotini, greece which is a truly multicultural place, I got to taste a few eastern recipes and let me tell you they are addicting! The book looks so lavish I need this one! These sweet puff pastry looks really good. I was reading through the recipe list and the cooking procedure and I think I can successfully bake these treats at home. Thanks for sharing. That only takes 40 minutes to make? That's impressive. It looks absolutely divine and the setting is beautiful! I never knew that some recipe books have storyline or something more than just recipes. Got to know something new! These look like a delicious dessert to end a meal! I'm a big fan of cookery books too. These biscuits look so different, I bet they taste amazing too! How clever! These look easy enough that maybe even I can make this. The cookbook looks like a winner to me:) Thanks for sharing this! These are so sweet the way you made the rise up in the center. They sound delicious too! These look lovely and beautifully spiced! Have heard about this but reading the recipe for first time, lovely recipe bookmarking it to try later, thanks for the lovely share. I LOVE cookbooks -- read them like novels :-) That really sounds like an amazing cookbook. Bakar khani looks like a flaky and delicious sweet treat. This is amazing recipe.. I have to try this one. I like making stuff with puff pastry. The flaky texture is so nice . Such a cool and easy biscuits, and simply love these sort of flaky biscuts, so tempting. We share a common interest. Reading cookbooks and gazing at the pics and trying recipes. While there is internet full of recipes, nothing matches cookbooks. The stories, visuals and the dish all are eye catching. Although I try the recipes from certain cook books at home, sadly none of it has come on the blog yet. I think this is a good inspiration for me. It is equally fascinating to see various dishes from different locations / countries using similar ingredients but churning out a different end product. What beauties those puff pastries are! A cup of tea and some of these would be excellent. Sounds like a great book! Perfect tea time snack and amazing click ! Simply sensational dear simply sensational. Love the pics n the recipe sounds yummy. I have some puff pastry , will make these amazing biscuits real soon. Beautiful pictures Nayana. This looks crispy and delicious. I love to read cook books and try them immediately:) Nice post. So crispy and flaky.. When i get puff pastry sure will try this out!! such a beautiful props with a great recipe. I liked the book introduction though I do not own many cookbooks only four so far. Puff pastry biscuits looking very tempting. 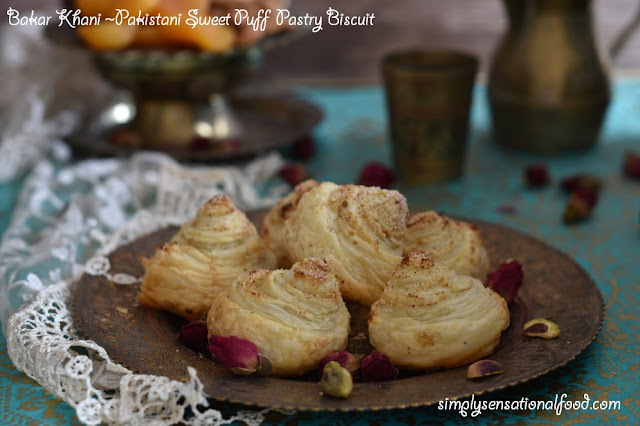 Beautiful styling and photography and these Puff pastry biscuits look amazing. I love cook books too and I feel they are more comfortable when it comes to learning as compared to internet. I love cookery books especially the ones that have a story to tell. Beautiful clicks, just couldn't stop oogling at them. The pastries look so tempting. I wanted to thank you for this excellent read!! I definitely loved every little bit of it. I have you bookmarked your site to check out the new stuff you post. Customers Reviews.